Nestling at the foot of the southern slopes of the Mendip Hills in Somerset, the parish of Compton Bishop comprises the settlements of Cross, Newtown, Rackley, Webbington and of course Compton Bishop itself. Compton Bishop nestles in an unspoilt area of outstanding natural beauty (AONB), visited by many who appreciate the beautiful breath-taking scenery. The parish has a network of more than 13 miles of well-used public footpaths, bridleways and permissive paths which provide a wonderful variety of routes with Crook Peak and Wavering Down dominating the sky-line. This area of The Mendip Hills is owned and cared for by the National Trust and provides a peaceful recreational space for all who visit. This web site provides information on local groups, items of local interest as well as all Parish Council information, minutes, etc. Parish Council Elections will take place on Thursday 2nd May together with Sedgemoor District Council elections. Compton Bishop Parish Council comprises seven Councillors and nominations are required to be completed between 18th March and 3rd April. Click here for the link to The Electoral Commission's Guidance documents. Excavation and construction of the underground cable network between Sandford and Biddisham will start in the next few weeks. Due to their great success in our area they are urgently looking for more staff to help run the unit. There are a number of ways you could help so please click here for more information or contact Baz Hamblin - email co.axbridgeseacadets@gmail.com. There may be some disruption during the refurbishment of the decking on Ham Lane Bridge in Loxton. 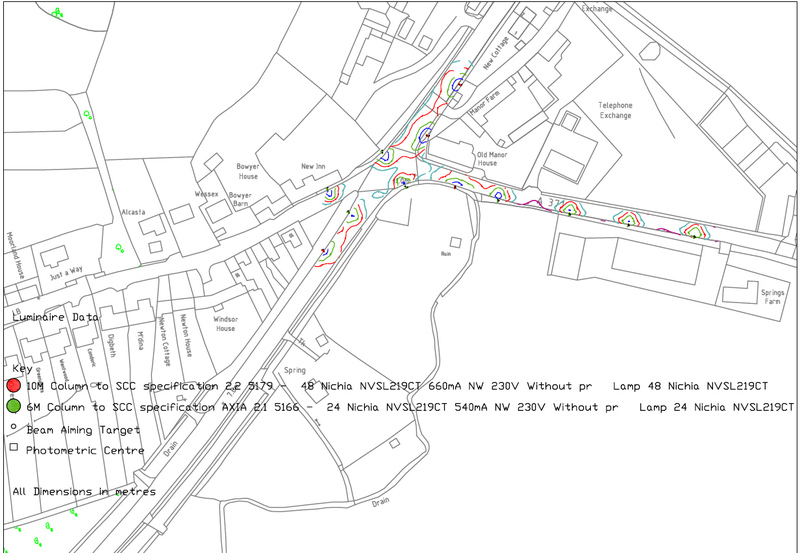 The works will start at the end of January and is being done by the Environment Agency. This has nothing to do with the National Grid’s Hinkley C connection project. National Grid will be starting the first phase of their connection project in March 2019. These preparatory works will be vegetation clearance, coppicing and topping trees. The purpose is to prevent wildlife from nesting in areas where the construction works will take place. They will also be installing reptile fencing to prevent newts and snakes entering areas where excavation would remove their habitats. A ‘Drop-In’ exhibition will be held for the general public to attend and meet with members of the National Grid team. Please take a note of the one nearest to your home and make an accessible list of people and their telephone number who could assist in retrieving a defibrillator in an hour of need. Defibrillators increase the chances of survival following cardiac arrest so please make a plan in your household of what to do After you have telephoned 999. The ambulance service will give you the keypad access code to your nearest defibrillator. 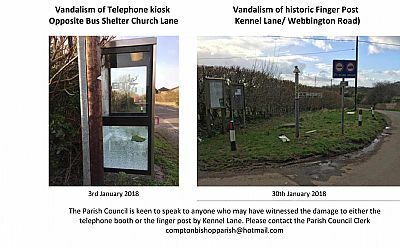 The Parish Council is commissioning a local firm to repair and refurbish our finger posts. It is hoped that work will be able to start jn the new year. During December, there have been a number of attacks by a dog, or dogs, resulting in domestic chickens in Compton Bishop being killed. The dog(s) was not on a lead. In mid December one ram had its back leg torn by an attack from a dog and two sheep killed in Cross Quarry. A local farmer reported that he has lost 22 sheep since they were put out for grazing, in May/June, on our local hills around Crook Peak and Cross Plain. It is not known whether this is the work of one rogue dog or more but the owners, if located, can be held responsible and prosecuted. The most recent incident was seen to be a loose dog terrorising of pregnant ewes up and down the side of the hill chasing them and splitting them in all directions chasing one down into the bushes. The dog was caught after 10 minutes but no information was reported. It is possible that many ewes will miscarry after this incident. Please follow the Countryside Code and keep dogs on a lead and controlled at all times when livestock are present and do not let your dog out of your sight and control. A phone call that promises to lower your Council Tax banding for a fee of up £120 may sound like a great offer, but you can find out if your band can be lowered for free. Sedgemoor District Council is warning residents to be aware of Council Tax scammers who may offer you deals to reduce monthly payments or reduce your banding. SDC has taken calls from worried residents, so are warning everyone not to be duped. One current scam that has been bought to the district council’s attention is from a company claiming to be called ‘All Claim Solutions’ who say they are calling on behalf of the Valuation Office or Sedgemoor District Council and ask for £120 to lower your Council Tax banding. Please note this is not a phone call from Sedgemoor District Council or the Valuation Office, despite their phone number being very similar to that of SDC. Council Tax bands are set by the Valuation Office Agency and can only be changed under certain conditions. Details can be found at www.gov.uk/council-tax-appeals. You will not be charged for the service.